Eliminating the “fillers” will cleanse your palette and allow you to define your style with your basics. If you don’t love it, leave it. There’s no better time to start decluttering your home than the beginning of a new year! After taking down your holiday décor, it gives you a fresh take on your space and creates new design opportunities. It’s so refreshing to feel your room open up and see potential for more minimal décor, at least for now. Let’s be honest, as the year goes on we tend to collect more and more. So here it is—a stab at helping you start your year off with organization tied into design to make your home feel new again! –Get a planner. Remember: steady wins the race. Space out your cleansing over a whole month as opposed to just one week. Write down your weekly goals and assign each room to be finished on a specific day. If you’re anything like me, once you see it in ink you actually have to finish it! –Treat yourself each time you complete a room. Everyone has their own idea of rewards, but for me I spoil myself with replacing worn bedding or new artwork. However, you cannot add without taking away! I use this rule of thumb in my closet as well—every time you buy something new, you have to get rid of/donate/gift another item. –Go room by room. STAY FOCUSED! If you’ve ever met a designer or artsy type, we tend to stray from the task at hand. Maintain momentum in a single room at a time until it is finished. Try not to move clutter from one room to the next, it will only create more mess when you get to that space. Minimize your accessories like that stack of books on your bedside table you never read. The less clutter you have, the less organizing you have to do later on. –Identify your favorite accessories and artwork and set aside the less favorable. If you’re holding onto that hideous red vase your mother-in-law gifted you, find a good hiding spot for it and bring it back out when she comes to visit. If your throw pillows look like an elephant has used it as a seat cushion, donate it. Eliminating the “fillers” will cleanse your palette and allow you to define your style with your basics. If you don’t love it, leave it. –Group by color. Light to dark, left to right. This is as visually pleasing as it is organizationally pleasing. 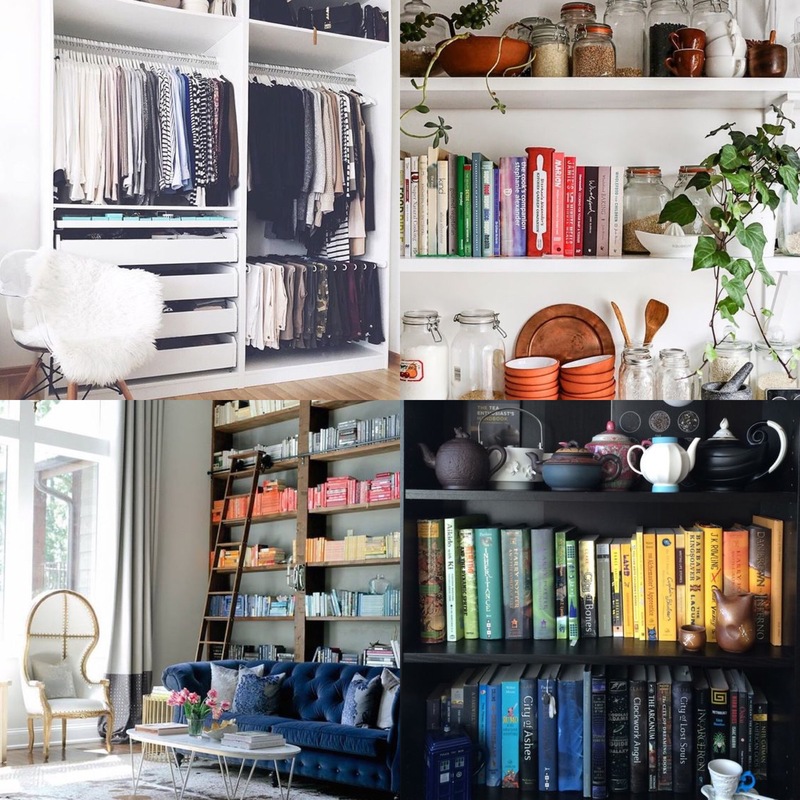 Manage your bookshelves, pantry, closet, drawers, etc. in this fashion and you will be amazed how quickly you can locate items. Not to mention, it’s just prettier! –If all else fails and you get overwhelmed by breaking up with your décor, CALL US! Design and organization go hand in hand and there is no better crew than the BW Design Team to expedite the decluttering and re-beautifying process. When your space is in order and looks the way you’ve only dreamed, it’s astonishing how smooth your life will run. Cheers to a new year!